As with past years, Apple's WWDC 2016 keynote showcased the upcoming updates to Apple's operating systems and developer tools. It's hard to believe that iOS is now on its tenth major version, which put Apple in an interesting position since their desktop operating system has been called OS X for many years now. Given that Apple's other operating systems are named iOS, watchOS, and tvOS, the name OS X has become a bit of an outlier. This year's release comes with a new name in the typical manner that OS X releases each had a specific name, but also a new name for the operating system itself. The 2016 version of Apple's operating system for Macs is named macOS Sierra. 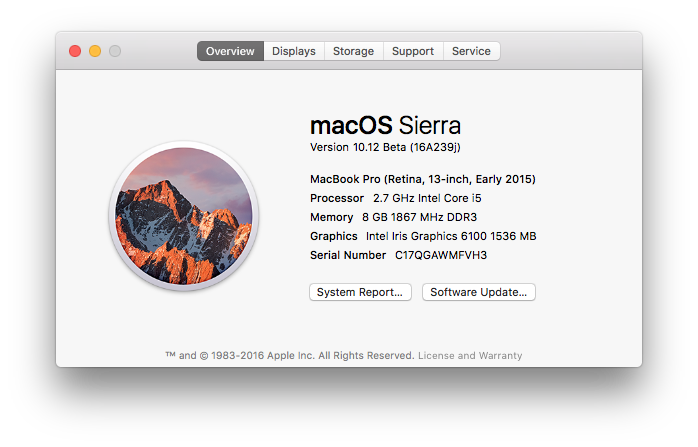 While macOS adopts a new name, it retains the existing versioning system, with macOS Sierra being version 10.12. This makes sense when you consider the progression from Mac OS 9 to Mac OS X, which then treated each release as a point update on top of ten and only dropped the Mac in the name in 2012. This kind of versioning is somewhat awkward, and will be more so when it gets to the point where the OS is version 10.20. It will be interesting to see if the next truly large update to macOS brings it to major version eleven, and it could be that Apple plans to keep it in sync with iOS with a new major version number each year, but only time will tell. Like all updates to macOS, Sierra comes with a number of new features. With the bulk of Apple's device sales being mobile devices, there have been a number of features in recent versions of macOS that work to leverage how devices running macOS, iOS, and watchOS can work together. Having cloud sync across devices is one thing, but building and properly executing Apple's continuity features really requires control over the hardware and software stacks across all devices. Unfortunately it's difficult to test these features during Apple's beta period, but that just gives Apple's users things to look forward to later in the year. More important than new features is whether or not a Mac can even be upgraded to macOS Sierra from OS X El Capitan. Apple has announced the compatibility list for Sierra, and there are some older Macs that have dropped off the list. I've put together a chart comparing the compatibility of Macs with El Captain and compatibility with Sierra. As you can see, it looks like Apple has put the cutoff point right around the start of this decade. The old MacBook and iMac that released in late 2009 make the cut, but everything else has to be a model from 2010. The uniformity of the cutoff makes it fairly likely that this was a somewhat arbitary decision, although it's difficult to say exactly how many older Macs could have been put on the list because Apple offers many SKUs and CTO options that could make one version of an older Mac fast enough and another from the same line too slow. In any case, the easy rule with Sierra is that if your Mac is from before 2010 it's probably not supported, and if you're in that group you're probably overdue for an upgrade anyway. 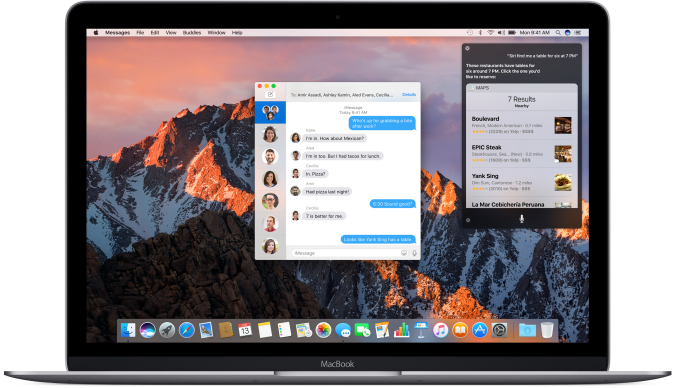 With Apple having just released their public beta of macOS Sierra, it's worth going over the major features that are currently available for users to try before the OS is officially launched later this year. Features like Auto Unlock and Apple Pay on the web can't really be shown right now, but it is possible to show other features that work between iOS and macOS devices like the additions to Messages and Photos. While I think the smaller and more subtle features in software updates can be some of the most useful, It's probably best to start off with the biggest feature in Sierra, which is Siri coming to the Mac. "Most important of all is that this does not count against your iCloud storage. " Hmm, seems to me there's two very different components to that feature... When it "moves" stuff like system fonts, language packs, and apps it's not really storing anything FOR you... It's just deleting OS elements like you've always been able to, rather than reinstalling from disc like in the days of yore you simply reinstall from their servers. This is exactly what we Mac power users have been wishing for. This website has continually gotten worse ever since Anand left.